Inversion therapy has been becoming more popular, but what is all the hype about? What makes inversion therapy so beneficial to do? Well, inversion has been a form of therapy in India and Japan since ancient times; it is a type of stretching meditation that you take part in that raises your feet above your head. In some positions, your feet remain on the ground, but the most important thing is that your head is lower than your heart during the therapy session. If done correctly for a few minutes two to three times a day, you will see great results that can benefit your health and well being. 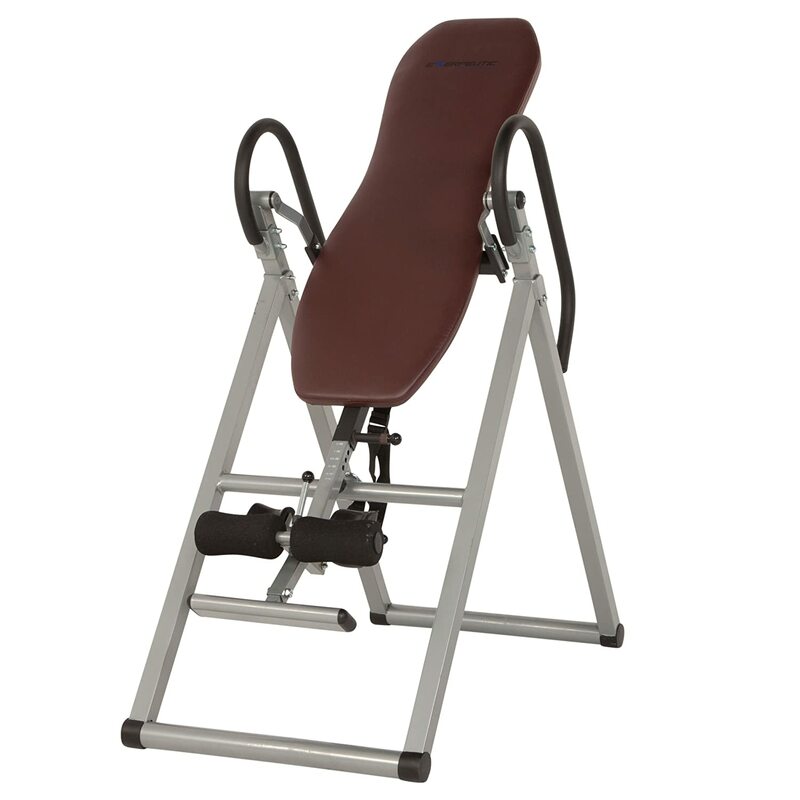 One way to easily complete this regiment is to purchase an inversion table that will help you ease into the practice. But which inversion table is best? What features should a good inversion table have? Our guide will help you make these considerations and show you a few options that may be good for you. Our first pick is the Ironman Gravity 4000, which is a device that is actually quit heavy; weighing in at 75 pounds. It has the dimensions of 26 inches (width), 65 inches (height), and 49 inches (depth), which means that once you find a spot for it, it may only be moved on occasion. It does however fold up easily to be placed in a closet or out of sight when needed, which is convenient. The assembly of this device is pretty straight forward, so it should only take about 30 minutes to complete. It is designed with a heavy duty tubular steel frame that is extra wide for added comfort. In addition, it is also coated in an anti-scratch powder that is designed to make the unit more durable. It is covered with a double stitched cushion that is made from a memory foam vinyl backrest that is designed to give you all of the comfort that you need. A lumbar pillow is included to add additional comfort to your session, which can be removed at any time. The sides of this inversion table are also covered in the double stitched vinyl to protect your fingers from getting pinched between the joints of the unit. The ankle cushions are designed to be adjusted to the shape of your foot and molded into place. This will ensure that your ankles will be secure, even when you are being inverted to a full 180 degrees, which is a full half circle. Securing your feet is made simple with the ratchet type locking system that is designed to be easy to reach with the palm activation feature. On both sides of the inversion table there are U-shaped hand rails that can be used to stabilize yourself while you are inverting the table. To invert the unit, all you need to do is secure your feet in the lock, and then lean back against the back rest. This will slowly allow the board to lean backwards, and at that point all you have to do is raise your arms to finish the inversion. When you are ready to get your feet back on the ground, all you need to do is utilize the extra long safety handles that are seen on each side of the unit. The backrest is designed to give support for anyone who is taller than four feet and ten inches, but shorter than six feet and six inches. This covers a large range of individuals, but not everyone fits in that range. You must also weight under 350 pounds to use this inversion table, as safety is important. The joints of this unit are designed to pivot; this means that there will be no squeaking while you are stretching and moving around on the table. • More relaxed back muscles due to a straighter spine. Our silver selection is the Innova ITX9700, which is another inversion table that you may not want to move around a lot because it weighs about 55 pounds. If you have a space that fits the dimensions of 63 inches (height), 28 inches (width), 46 inches (depth), then it may be beneficial to make it a permanent home for the unit. If not, it can easily be folded and put out of sight. This Innova unit is designed for anyone who is over four feet and ten inches tall, as long as they are also less than six feet and six inches tall. There is also a weight limit of 300 pounds to use this device. The frame is comprised of a 1.5 inch square inch tube that is made from steel. For your safety, the locking mechanism is a four position system that locks the frame in place. The back rest is made from memory foam, which is a very comfortable option. The ankle holder features a four cup design that encloses the ankles and locks you securely in place. The handles on the unit are designed to be comfortable and safe at the same time, so they sport an ergonomic grip handle that is non-slip. There is also a removable head pillow that can be used for comfort as well as an additional one that can be used with either a hot or cold press to add additional relief of lower back pain. • Improved Circulation – This is a great benefit to have. The better your blood flows, the more oxygen will get to your brain, which means that the lymph system can remove toxins from your blood stream. • Improved Digestion – Gravity will grant waste elimination, which means that your digestive track will be free. • Headache reduction – Stretching your spine and freeing any pinched nerves can reduce the amount of headaches you get. • Increased Brain Function – You will also feel more alert and focused throughout the day with this benefit. Teeter, which is the manufacturer of our third selection, is a company that has over 30 years of experience, and that is exactly what landed them on this list; their experience and their dedication to their customers. 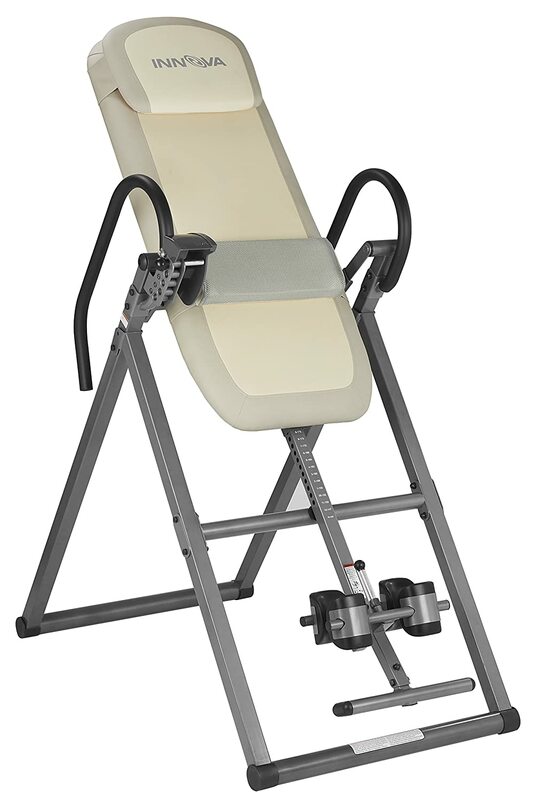 Our bronze pick is the Teeter Hang Ups 560, which is an inversion table that is great for inversion therapy. It is a little bit of a larger model than out silver pick, but does weight less than our gold pick. This unit is 84 inches high, 28.8 inches wide, and 86 inches deep. It is not the most natural inversion table to have around, but if you do need to move it at any time, it does fold up into a smaller, easier-to-carry size. This device is designed to be used by an individual who is over four feet and eight inches tall, which means that the maximum height of an individual that should utilize this Teeter inversion table would be six feet and six inches. The maximum weight that is recommended for the Teeter 560 is 300 pounds. The ankle lock is fitted with an ergo embrace system that is designed to keep you snuggly in place without risking injury. It features both an ankle locking system and a comfort dial that will keep you comfortable. This unit also comes with an extremely comfortable back rest. The ComforTrak bed is designed to be a durable, yet comfortable layout that can be simply laid upon, or it can utilize some additional accessories to make the experience more enjoyable. You can add the accessories to enjoy a pressure massage while experiencing inversion therapy or you can have lower back support increased to accommodate your needs. With the Teeter Hang Up, you can preset the unit to a certain rotation that is in your therapy exercises. These can be done when the table is in the full 180 degree location. Here the controls will be locked out to ensure that unwelcomed incidents do not occur. 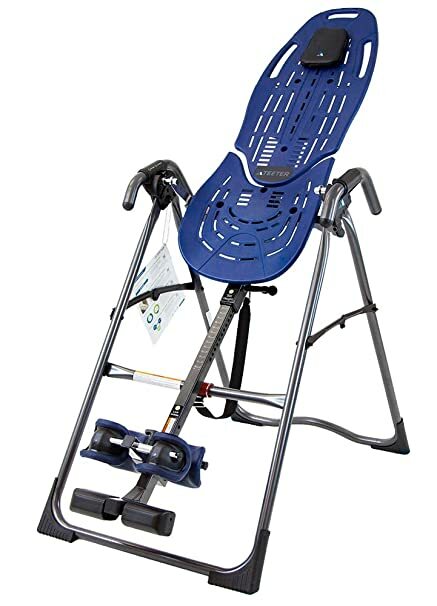 When you decide to purchase this inversion table, there is a DVD included with it that gives you five different healthy back routines that you can try. Each one is different, and they are not the only ones available to try, but these five give you a place to start if you have never used an inversion table before. This model has a lot of benefits to your health that you will notice when you use the inversion table a few times each day. First, it will be a great way to help relieve any stress and back pain in your lower back. It will also be an effective way to relieve joint and muscle pain. Stress is a main factor that causes pain and discomfort, so if you are able to reduce that stress by using this device, then you will feel less anxiety as well, which will also help you sleep better. When it comes to the reviews of this inversion table, there are about 250 that can be seen on Amazon. Out of all of the reviews that have been posted there, 91 percent of them were given a positive rating that was worth four or five stars. In fact, about 80 percent of all of the testimonials seen on the site decided to rate this device with a five star rating. Many of the users on Amazon have expressed their appreciation for having this inversion table, as it has helped quite a few people with extremely painful medical conditions. Our final pick is an Exerpeutic inversion table, which is a great low cost option that gives you the same therapeutic results as the other options on our list, so if you are ballin’ on a budget, why not give this final pick a shot? It is a great way to relieve your lower back and allow yourself to relax, at least for a few minutes each day. This inversion table is one of the smallest, more lightweight options that we have reviewed, but still weighs about 55 pounds, so some may have difficulties maneuvering if the need arises. The unit is 46 inches long, 27 inches wide, and 57 inched high, which means that it is small enough to fold when you need to put it out of view. You can easily place the folded table in a closet or lay it flat under your bed. The Exerpeutic is designed with a sturdy steel frame that is about one and a half inches in diameter. It features an A Frame design that is perfect for adding stability to the unit. In addition, the frame is coated with a powdered substance that makes the surface scratch resistant, which means that is will be more durable overall, not just to abrasions. This inversion table does need a little bit of assembly, but it should not take you more than 45 minutes to complete. The 180 degree inversion from this table is perfect for anyone trying to stretch out their lower back. The back support is able to accommodate anyone that is between four feet and ten inches to a full six feet and six inches in height. It has a weight limit of 300 pounds, but that can be a common limit, even on more expensive options. The backrest is made from a soft foam material that is rigid and firm, yet soft and welcoming. To secure yourself in place, you must place your feet on the foot rests, then secure your ankles in place with the foam rollers. There is also a pair of long foam covered handles that can be used to stabilize and secure yourself as you are pulling yourself back up and placing your feet on the ground. An adjustable tether strap is also available to help you have control over each inversion and give you the optimal incline positions. This unit is designed to relieve the stress and pressure that is built up on your muscles and lower back. 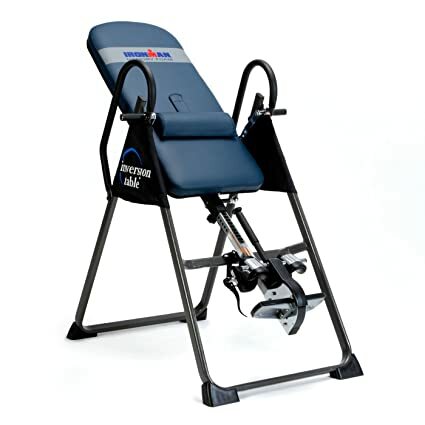 Just a few minutes on this inversion table will reduce your fatigue and give you a deeper sense of relaxation. Your blood will circulate better, therefore you will feel more at peace since you will be able to breathe deeper without allergens interfering. This unit also comes with a limited one year warranty. • Pain – Pain is a major issue with a lot of individuals, so they turn to inversion therapy to help relieve issues like back pain, Pain from a herniated disc, sciatic nerve pain, cervical spinal stenosis, osteoarthritis, scoliosis, and fibromyalgia. This type of therapy can also be a great way to reduce the amount of headaches you have and possibly remove them completely. • Circulatory Issues – If you have bad circulation, inversion therapy can help get your blood flowing as well as improve your heart function and alleviate varicose veins. • Respiratory Issues – Since your blood will be flowing better once you start this therapy, you will find that you have an improved lung function that is no longer hindered by allergens, so you will be able to breathe fuller, healthier breaths. • Digestive and Immune System Issues – This type of therapy is designed to aid in your digestion, revitalize your internal organs, and help your lymphatic system to function better. A boost in your immune system is also a possible result. • Mental Health Issues – Inversion therapy is designed to help you relieve stress on your body and your mind. You will feel more alert and find yourself thinking more creatively. Depression and mood swings will decrease as well as other symptoms relating to PMS. • Physical Fitness Concerns – Inversion therapy will help you improve your posture and your overall flexibility. You will no longer feel tiredness and fatigue all the time; instead you will feel revitalized and energetic. Your sleep quality will improve, and you will feel a lot healthier and younger than you did before doing inversion therapy. One of the most important things to consider when purchasing an inversion table is to make sure that the frame is sturdy enough to hold your weight. Also, make sure that the device you choose has floor stabilizers to make sure that the inversion table does not slip or slide in any way while you are on it. The last thing you want to experience is your inversion table collapsing because you did not confirm that you had a safe and durable frame. In many situations the reason that you are using an inversion table is because you have health issues and ailments that you want to relieve. The worst way to relieve pain is to cause more of it because your inversion experience was not comfortable for you. A comfort pad that can be attached to the unit is a great way to make sure that the board’s stiffness will not cause you further pain and agony. Choose a backrest that is fitted with some memory foam or another type of soft material that will be comfortable for years. Inverting should be a simple task that can be done easily. If your transition is awkward and unpredictable, then chances are that your technique or the table that you are using is not the safest option. Once an inversion table becomes jolty, then your safety can also become threatened. Having a wide range of motion is the best way to get the most out of your new inversion table. Ideally, you want to go a full 180 degrees around so that you are completely upside down. This range of motion will give you the best angles to stretch your body. An inversion table is relatively large, so it is reasonable to keep it set up between uses, but what about when you need to put it away when guests come over? If you have the unit in the basement, keeping it there may not be an issue, but if your inversion table is set up in your main living space, then you will most likely want to store it away for a period of time. Luckily for you, most inversion tables fold away nicely without much difficulty; however, they may still be a bit heavy to heft too far. Chances are that you have some type of pain that you want to relieve, which means that you will now want to spend five hours putting together an inversion table. It could be that if your movement is limited in any way, you would not be able to do so at all. Constructing any inversion table should be an easy, straight forward job that should not take longer than an hour to complete. All of the picks on our list can easily be put together in under an hour. As with any larger than average purchase, you want to make sure that it is covered by a warranty if anything goes wrong with the device right after you purchase it. Try to get at least a five year warranty with your inversion table to limit your maintenance and repair costs during that period of time. Inversion is a great way to improve the status of your ailments or to simply increase your blood flow to make you fell energized. We have given you a few options to consider as well as a list of pre-purchase considerations to look at in this guide. Now that you know why an inversion table is great to have and the features that will benefit you the most, it is time to put your feet in the air and your head on the ground for a few minutes each day. Make an educated purchase that is designed to benefit you for years to come, and you will be amazed by the results.